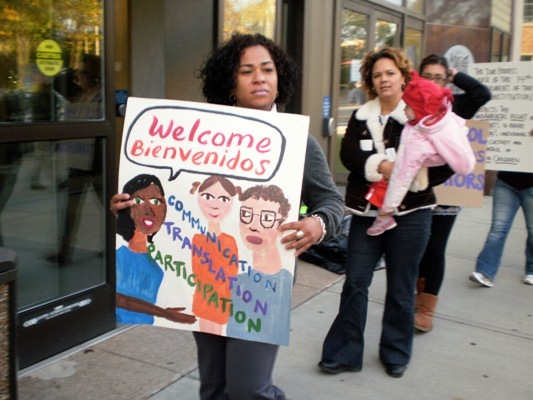 NEW HAVEN, Conn.—The grassroots parent organization, Teach Our Children, rallied at the Board of Education recently to protest the lack of translators at mandatory parent orientations. The New Haven Superintendent Dr. Reginald Mayo promised Teach Our Children in an Aug. 5 meeting that he would provide Spanish translators at parent orientations in every school, beginning in the 2009-2010 school year. The promise was not kept, TOC charges. At least nine schools had no translator at the orientation, according to a preliminary survey conducted by TOC. In order to demonstrate that parents were being left out, TOC entered the Board of Education public meeting with tape over their mouths. Alberto Nieves, a TOC parent who was at the meeting with Dr. Mayo, testified to the Board of Education about his experience attending the parent orientation at his daughter’s school. “I was disappointed,” said Nieves. “Dr. Mayo had promised a translator, but there was none. The principal passed out a manual with basic information about school policies. It was in English only.” At Bishop Woods school 17% of the students come from Spanish-speaking households. “It’s unfortunate that we have to protest to make our voices heard, but we have tried all other channels,” says TOC parent Nilda Aponte, an organizer of the protest. TOC parents have spoken with various administrators about the lack of translators. The TOC list of proposed improvements also includes the translation of all school documents and notices into Spanish, especially those that require a parent signature; Spanish translation at the public Board of Education meetings; the availability of interpreters in the school system and in each school; and finally a directory of interpreters who work for the district that would be available to parents.